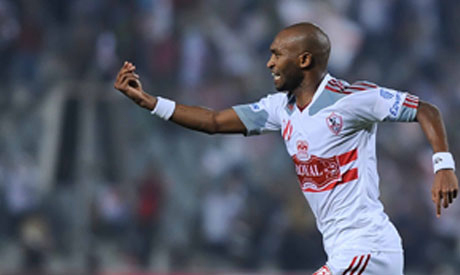 Zamalek have officially signed their former winger Mahmoud 'Shikabala' Abdel-Razek after his unsuccessful attempt with Portuguese side Sporting Lisbon. "Zamalek chairman Mortada Mansour has approved a five-season contract deal with the player," the club's official website stated on Thursday. The 29-year-old, who joined Lisbon from Zamalek in January 2014, has been absent since last September after a dispute with the Portuguese club. The player is set to be loaned to Egyptian league side Ismaily as there is no place for the player in Zamalek's closed squad this season. The Aswan-born talent first starred for Zamalek in 1996, catching the eyes of many with his skills and also inspired the Whites to win the Egyptian League in 2004 and the Egypt Cup in 2008 and 2013. Shikabala played for the Greek side PAOK between 2005 and 2007 and was loaned for Al-Wasl of the United Arab Emirates in the 2012-13 season. The 29-year-old has made a few international appearances with Egypt throughout his career. He was part of the Pharaohs' squad that won the 2010 Africa Cup of Nations, yet he played only a single game in the continental competition.